I am most happy to invite you for the 7th Int. tangofestival Doble Ocho !! In March 2010 Nijmegen will be transformed to Buenos Aires at the River Waal ! The 7th Int. 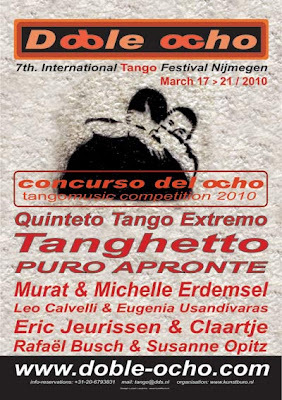 Tangofestival Doble Ocho will transform Holland’s oldest city into Tango-City starting with a special pre-programme celebrating the 200 year existence of the Republic of Argentine. The renewing quintet Tango Extremo will kick-off the tangofestival on march 17 with their theatre show ‘Carnaval de Buenos Aires’. Also the TangoFusion Music JAM will take place that day in Lindenberg café 23 offering an interactive experience and process of improvisation and creation between the musicians and the dancers. For this event Gustavo Mozzi and Latin Grammy Award winner Facundo Guevara (ARG) is invited. Thursday is fusion day and the famous Tango electro band TANGHETTO will give their concert in the beautiful WAALZAAL of the Nijmegen theatre. TANGHETTO recently won the prestigious Carlos Gardel Award in Argentine. For visuals the German Tanguerilla offers ‘a visual concept lounge with interactive video-Installations and immerging space-concept’. Friday is the traditional presentation of the winner of the tangomusic Contest during the salon at night, where Rafaël and Susanne will perform. The winner is chosen in the afternoon by a professional jury. Saturday the GRAN NOCHE will make your feet tired and your ears longing for even more Music. This evening the Berlin based Puro Apronte will make you dance non stop, with well known Bandoneonplayer Michael Reil. The only break will be for the show of the Maestro’s of the festival. Switch dancefloors when you like, there is a special fusion floor with DJ Arthur ( Yes, he is back at doble ocho ! ) And after a few hours of sleep, the tangocafé will offer another live music experience, followed by the farewell salon in, finally, El Corte !! With a warm welcome ! 88 on facebook become a Volunteer ! Registration Doble Ocho 2010 open !